1 Colchester Castle – The castle is under refurbishment during 2013, old displays are being stripped out and it’s in with the new. Happening History will be there for a special open day. Come and be put on trial for your crimes and learn what constituted a crime in medieval times and what the brutal trials and punishments might have been. There will also be the opportunity to try on medieval clothes, perfect for your princesses and little lords. 20-21 Dover Castle – Celebrate St Georges day by coming along to Dover Castle. Event details to follow. 26-27 Audley End House & Gardens – Audley End through time – multi period event. A brand new display for 2013! 18th century criminal trials. Our magistrate will put you on trial for your crimes and through some of the milder punisments. Great for kids and adults alike. With timed trials run throughout the day. Learn about body snatchers, highwaymen and the bloody code! Also brand new for 2013 is our ‘Tuppence through time’ display. Learn what money from the past was like and how much you could buy for your penny. How many chickens could you buy for a penny in the 9th century? What things have cost more over time and which things less? Find out by spending a penny or two in our time travellers shop. Mint your own hammered coin to take home. 24-28 Bodiam Castle – Medieval week for schools. Would you like to visit Bodiam Castle, why not make your students visit even more special by visiting Happening History at the castle. All week we will be running displays on medieval life. Students can learn about clothing, food, marriage, try on armour, hold a weapon or learn about medieval surgery. Booking is essential so please contact the castle directly or we’d be happy to pass on your details. 1-5 Bodiam Castle – Medieval week for schools. Would you like to visit Bodiam Castle, why not make your students visit even more special by visiting Happening History at the castle. All week we will be running displays on medieval life. Students can learn about clothing, food, marriage, try on armour, hold a weapon or learn about medieval surgery. Booking is essential so please contact the castle directly or we’d be happy to pass on your details. 22-26 Audley End House & Gardens – Kids WWII training – Come meet Fred the Air Raid Warden as he drills you through all matters ARP, learn how to tackle firebomb fritz, what a gas mask was really like and try out the real morrison shelter for size! Ivy will be on hand to explain the rationing system. Young visitors can measure out a weeks rations and mark them off in the ration book. 30 Chesterfield Museum – Come & meet the miller. Learn about the different grains and have a go at milling some yourself on our quern. Find out what breads they ate and what horrible added extras they might find within them! 5-9 Wrest Park Gardens – Soldiers School – As part of a larger event our magistrate will be putting you on trial for your wartime crimes! What would be the penalty for throwing away a bus ticket? Why was it wrong to feed the birds? Are any of the audience fifth columnists? Ending with the trial of that most infamous of medieval criminals, the spiv! Ivy will be on hand to explain the rationing system. Young visitors can measure out a weeks rations and mark them off in the ration book. 11 – 13 Eltham Palace & Gardens – Our first ever event at this beautiful palace with its wonderful medieval Great hall. Soldiers School – Our magistrate will be putting you on trial for your wartime crimes! What would be the penalty for throwing away a bus ticket? Why was it wrong to feed the birds? Are any of the audience fifth columnists? Ending with the trial of that most infamous of medieval criminals, the spiv! Ivy will be on hand to explain the rationing system. Young visitors can measure out a weeks rations and mark them off in the ration book. 25-26 English Heritage Event – Details to be confirmed. Watch this space. 23-27 Bodiam Castle – Medieval week for schools. Would you like to visit Bodiam Castle, why not make your students visit even more special by visiting Happening History at the castle. All week we will be running displays on medieval life. Students can learn about clothing, food, marriage, try on armour, hold a weapon or learn about medieval surgery. Booking is essential so please contact the castle directly or we’d be happy to pass on your details. 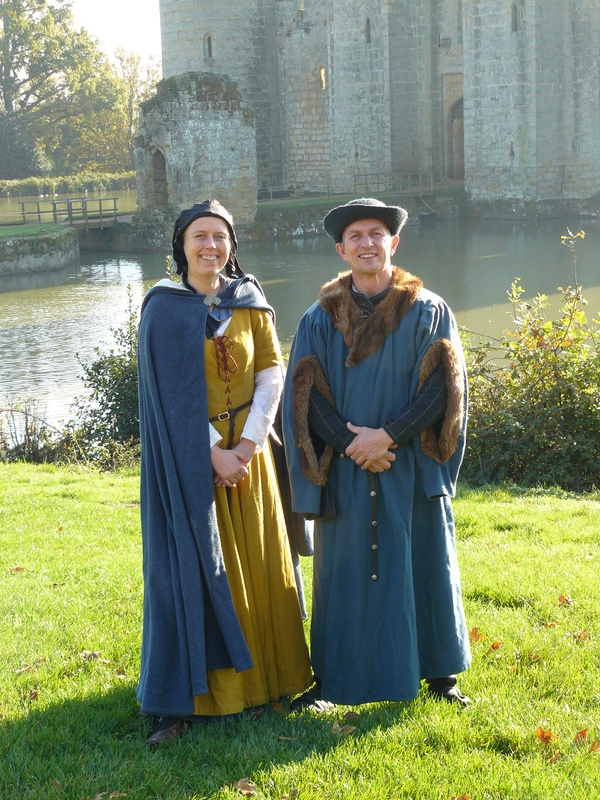 7-11 Bodiam Castle – Medieval week for schools. Would you like to visit Bodiam Castle, why not make your students visit even more special by visiting Happening History at the castle. All week we will be running displays on medieval life. Students can learn about clothing, food, marriage, try on armour, hold a weapon or learn about medieval surgery. Booking is essential so please contact the castle directly or we’d be happy to pass on your details. 26 & 27 Bodiam Castle – Get into gruesome mode in time for Halloween! The Sheriff (Or Shire-Reeve) will be holding trials throughout the day, learn about how you would have been tried or punished in medieval times but careful or you may end up in the stocks yourself! 2 & 3 Bodiam Castle – Possible evening event. Watch this space.